The new Bowers & Wilkins CM Series dramatically improves on the audiophile-quality performance and luxurious design for which the series is renowned. Combining the latest Bowers & Wilkins technologies – including Decoupled Double Dome tweeters – plus refined new styling and an entirely new addition to the range, the result is truly beautiful sound. The introduction of Bowers & Wilkins Decoupled Double Dome tweeter to 2013’s CM10 led to not just awards, but more importantly, massively improved audio performance. So the next logical step was to bring the same technology to the rest of the CM Series. For the first time the entire CM Series features these outstanding new tweeters, while the CM10 S2 and the completely new CM6 S2 (above) boast tweeter-on-top technology for an even more engaging performance. Bowers & Wilkins Double Dome tweeters use a thin aluminum dome surrounded by a thicker aluminum ring for the perfect combination of lightness and rigidity, helping prevent audible distortion. The result is stunning clarity and tonal purity. In the new CM Series this advanced tweeter is also decoupled – using a ring of gel cushioning to physically separate the assembly from the cabinet – to improve dispersion and imaging for an even more natural, spacious treble. The CM10 S2 and the new CM6 S2 also benefit from a tweeter-on-top design – a feature shared with our most advanced reference speaker range, the 800 Series Diamond. Isolating the tweeter in this way aids imaging and dispersion, creating a more lifelike sound and a better sense of space. These tweeter advances are just the first of many improvements; the new CM Series has been redesigned to deliver vastly improved audiophile-standard performance across the board. New crossovers use respected Mundorf capacitors throughout while Anti-Resonance dustcaps are employed across all bass/midrange drive units for smoother response and lower coloration. These improvements augment existing CM Series technologies such as FST midrange drive units in the CM8 S2, CM9 S2 and CM Centre 2 S2 plus, in the flagship CM10 S2, the additional clarity of a decoupled FST assembly. The new CM Series also look more beautiful than ever before. They retain the high-quality, real wood cabinets for which the range is renowned, but visible fixings have been removed for a cleaner, more subtle look. Yet even these visual improvements lead to acoustic benefits, as the incredibly solid cabinets and fixingless fascias help improve sound quality. The new, acoustically optimized and protective circular tweeter grilles further enhance the look of the new CM Series, while also protecting the tweeter. Bowers & Wilkins 800 Series Diamond and the surprisingly affordable new 600 Series, the new CM Series delivers stunning audiophile sound quality and subtle, stylish design perfect for home audio. The new CM Series truly is beautiful sound. The CM10 S2 remains the flagship floorstanding speaker in the range, and has been brought visually into line with the rest of the new models. As well as a Decoupled Double Dome tweeter on top, physically removed from the main cabinet for vastly improved audio performance without distortion – a technique taken from the tweeters in Bowers & Wilkins 800 Series Diamond – the CM10 S2 features three powerful 165mm bass drivers and a decoupled FST midrange driver. The CM9 S2 and CM8 S2 are the two remaining floorstanding speakers in the range. Both feature Decoupled Double Dome tweeters, FST midrange drivers and two bass drivers. The new CM8 is designed with a slimmer profile to fit a wider range of room sizes and configurations, while still delivering amazing clarity, detail and realism. 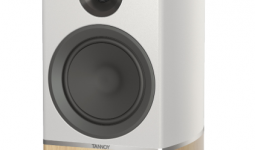 The CM5 S2 and CM1 S2 are the range’s two other standmount speakers. Both models employ new Decoupled Double Dome tweeter technology plus a host of other engineering advances, making for compact and discreet speakers that still deliver ample power plus pin-sharp precision. The CM Centre S2 and CM Centre 2 S2 also use Decoupled Double Dome tweeters while the CM Centre 2 S2 benefits from an FST midrange driver plus a pair of symmetrically arranged bass drivers to deliver superb centre channel performance. This makes the new CM Series ideal not just for stereo music but also for home cinema use. The ASW10CM S2 subwoofer features a 10inch drive unit paper/Kevlar® driver driven by a highly efficient 500W audiophile standard Class D amplifier and switch mode power supply. Completing the range is the new FS-CM S2 stand, with improved finish and design detailing to not only provide a supremely stable platform for the CM1 S2, CM5 S2 or CM6 S2 but also a perfect visual counterpart for the new models’ beautiful design.